The ACOS function in Excel calculates the arccosine (inverse of cosine) of a given number and returns the angle in radians between 0 and π. Arccosine is inverse of cosine. 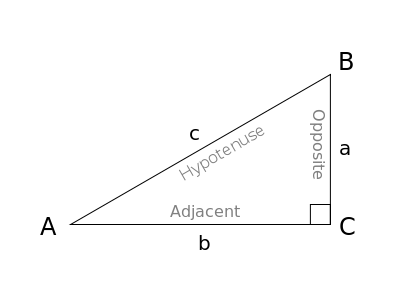 Arccosine of the adjacent side – b, divided by the hypotenuse – c equal to the angle θ. Where Argument number is a value between -1 and 1 which you need to calculate the arccosine. From Row number 2 to 5 ACOS is calculated in radians for value between -1 and 1 that is being passed as input to the ACOS Function. Note: if you want the value of ACOS Function to be calculated in degrees, then convert it in degrees using DEGREES Function as shown in 6th row.